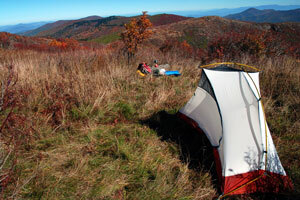 For the past few years, I have frequently used a one-man tent, even when hiking with friends. Unless you're backpacking with your soul mate, lover or spouse, having separate tents means you and your partners can go "solo together," and enjoy a bit of privacy, and better sleep. For many years the three pound MSR Hubba was the gold standard for go alone tents: free-standing, stable, roomy, and dry, and with the introduction of the HP model, usable for (almost) four seasons. Both are great tents, and I still use them. The evolution of that design, the MSR Carbon Reflex 1, is also a tent I use and recommend. But tent technology advanced to the point that two-man tents are almost as light as one man tents of similar design, but offer much greater comfort. I now use them more frequently, even though I still tent alone. The extra few ounces are well worth the comfort of a roomy abode in the backcountry, and two of the best examples are the Big Agnes UL Fly Creek 2 and the MSR Carbon Reflex 2. I grew to love this tent. 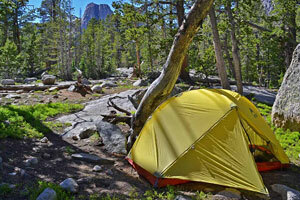 At 2 pounds 4 ounces with all the stakes, this is a legit double wall tent that is free standing, easy to pitch, roomy for one, a great star gazer when you don't need the fly, dependable in bad weather with zero condensation problems and beefy enough to stand up to the rain and hail of the Sierra and the Tetons. Big Agnes calls this a two person shelter, and that would work (you'd have to love your tent mate), but it may in fact be the best solo shelter currently out there. It's basically free standing, but if you want to be picky, not completely, as the low corners each require a stake. A nice touch is that when pitched with the fly, small clips pull on the tent body to offer expanded interior volume. 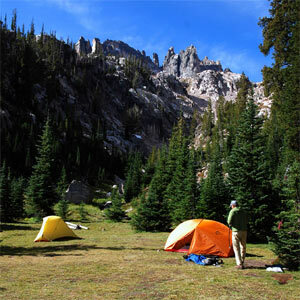 Without the fly, you can still pull out the tent walls to make a roomier tent. The solo version of this tent is quite similar, but it is just too small for my tastes. The Carbon Reflex 2 is basically a widened version of the Carbon Reflex 1, which is an evolution of the Hubba. This tent is roomy and tall, a comfortable solo tent and one that is practical for two hikers who love intimacy (or in a pinch). It's a little heavier than the Ultra Light Fly Creek 2, but has better headroom and a bigger vestibule for gear storage. I love the awning on the opposite side with zippered access, bone dry, perfect for boots. The twin storage areas maximize internal space. MSR got the weight down by using carbon poles, but note this is not a freestanding tent, and in fact performs best only when staked and guyed with some care. That takes a few minutes and is a camp chore I don't mind. When it made it's debut in 2009, the three pound MSR Hubba was a great leap forward, and became the benchmark for go alone tents: free-standing, stable, roomy, and dry. Despite coming in at under 3 pounds, the Hubba is no cream puff, and when staked out is incredibly stable in windy conditions. The Hubba kept me bone dry in record setting rain on the Chilkoot Pass trail. Basically all mesh is under the fly, as summer cranks in to autumn it can get breezy and chilly at night. That's where the Hubba HP comes in: this is basically the same tent as the Hubba but with fabric instead of mesh, so it can be zipped up in cold conditions. 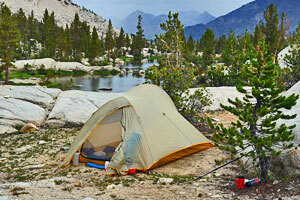 The introduction of the HP model made the tent usable for (almost) four seasons and actually saved an ounce or two. Both are still, in my opinion, a good choice for go light backpackers. MSR took that basic design and shaved off about three quarters of a pound when it produced the Carbon Reflex 1. It feels much the same inside, the weight reductions come from the revised, non-free-standing structure, lighter fabric, and carbon fiber poles. I like this version a lot for the 20 per cent weight reduction, but you've got to guy it out well to retain the stability I prized in the Hubba. For real world backpackers, having a trusted design that still saves an honest 12 ounces over the Hubba, makes the Carbon Reflex 1 another good, if more expensive, choice.